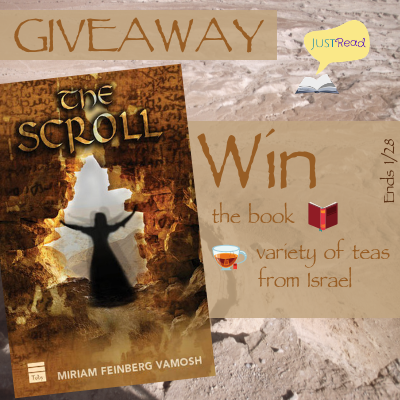 This fictionalized version of Miriam's story begins in the year 73 CE on Masada's final horrific day, where enemies within and without bring about the downfall of the last Jewish fortress. Its survivors are forced to choose between nation and family, and finally, between life and death. Will they learn the lessons of Masada's downfall? 1. 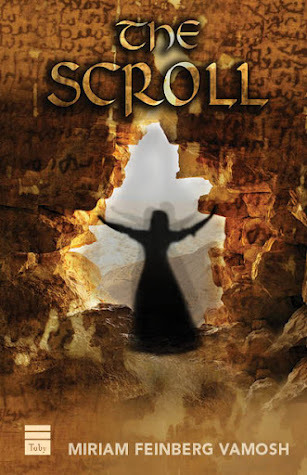 What inspired you to write THE SCROLL? From the time I began, as a tour educator, sharing the saga of Masada – about the last of the Jewish rebels against the Roman Empire in 73 AD who killed themselves rather than fall captive, the only survivors being two women and five children, people would inevitably ask me: “What happened to the survivors?” I would tell them history is silent about them and add: “Someday I’m going to tell that story.” I wanted to share how I imagined one particular woman took her fate in her own hands and chose life, for herself and for her descendants. When I found out that an ancient Jewish divorce document had been discovered in the 1950s in a cave in the Judean Desert, that it was “datelined” Masada before the end came there, and had the actual names of the man and the woman involved, I knew somehow that this ancient papyrus would help me tell that story. I also knew that although 2,000 have passed since the events, it is very relevant to our lives today. 2. Would you tell us a little more about the main characters? The character that starts off the story is a woman named Miriam. That was the name of the woman in the historical divorce document, and in a way that an author and her heroine would have the same name. But in the end I embraced it, deciding that it meant I’d be discovering how a modern Miriam would meet the challenges of an ancient one. I imagined that she grew up in a war-torn Jerusalem, her well-to-do family, seemingly oddly, joining the most extreme of the rebels. That is how she found herself at the cliff-top fortress of Masada with some 900 other rebels, eventually the last of the rebels to face off against Rome. Because she held a special position in the community, she was able to avoid the suicide pact their leaders were making. Together with her mother, and five orphan children, she is captured by the Romans, but escapes. Then, her passion for life leads her to make choices that few women of her time would make, hoping her own children would choose differently. As it turns out, she seems unable to escape her fate, and her only son can’t do so either. His name is Gabriel. He becomes a wealthy landlord in Galilee and tries to shield his family from harm. I had mixed feelings about Gabriel. He turned his back on everything his mother’s people had stood for, but he chose that path because he felt it was the best way to shield family from Romans. He had a daughter – Rebecca – whom he was grooming to become the dutiful wife of a landed farmer, which would keep her safe. But as it happens in many families, Rebecca also struck off on a path of her own – not her father’s. I liked the way Rebecca grew into her role, although as it turned out she was almost duped into it by a character from her grandmother Miriam’s past. His name was Samuel, and I almost hated the way he insinuated himself into their family to further a doomed cause. 3. Did you find any unique or surprising facts while researching the book? I discovered the historical background of a divorce situation the Jewish sages called a “conditional divorce” – essential to the beginning of The Scroll’s plot. It’s based on the ancient interpretation of a verse from, of all things, the story of of David and Goliath! 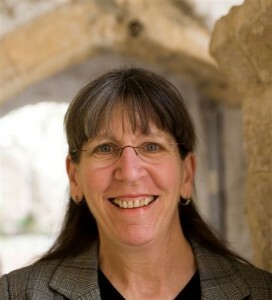 From that verse “And to thy brethren shalt thou bring greetings, and take their pledge (1 Sam 17:17–18).” Here’s where you can read more about it: https://www.jerusalemperspective.com/17073/. Divorce is considered an extremely serious last resort in Judaism, but permitted under certain circumstances. Ancient Jewish sages said one of these conditions could be if a man goes to war, he could (or should) give his wife a “conditional divorce.” That’s because there was almost no post-war “missing, presumed dead” category in ancient Jewish practice. And so if the warrior’s whereabouts were unknown, he might never return and his wife could never get on with her life. But if his wife had this document she could, under certain conditions, “activate” the divorce. I call this a “loving divorce,” because by granting it while still alive but at great risk, the husband was treating his wife with the utmost compassion. 4. What do you hope readers will come away with after they've read THE SCROLL? I hope readers will have a deeper understanding of one of the most tumultuous times in ancient Jewish history. I hope they will realize the extent of disunity among Jews as to how best to respond to Roman rule – some among them even believed that anything was legitimate, including the murder of other Jews, to throw off Roman rule. And I hope readers who already know that Jews in general have a keen sense of living their ancient history as if it were in the present will realize that disunity was our greatest enemy in those days, and still is today. That is one message. Another message is for both Christian and Jewish readers to immerse themselves in the incidents I present where Jews and early followers of the rabbi from Nazareth interact, and what each side takes away from those encounters, because it’s not what people usually imagine. 5. What site is a must-see for visitors to Israel? There are the all-time favorites like the Western Wall, the ancient historic churches and many other sites in Jerusalem, and the Dead Sea, Masada and Nazareth. There’s the Sea of Galilee its sites connected to the ministry of Jesus like the must-see traditional destinations like Capernaum and the Mount of Beatitudes – and a fascinating newly opened site, Magdala, the hometown of Mary Magdalene with a recently excavated synagogue from the time of Jesus. And now I’ll add some not-to-be-missed sites that I hope readers of The Scroll who visit (or have visited) Israel will be enriched by seeing, especially if they’re reading The Scroll, while they’re in Israel. Masada, is already on the list – some major moments in the beginning The Scroll take place there. And right down the road along the Dead Sea from Masada is the gorgeous oasis reserve of Ein Gedi, where you can walk to a sparkling waterfall and see the ruins of the town to which Samuel took Rebecca to meet her fate. There’s Beit Govrin – Miriam’s first real home after she opens a new chapter in her life not long after the fall of Masada. Beit Govrin National Park is less than an hour from Jerusalem and has Roman and other ruins and a fascinating underground city and rock-hewn caves. Then, there are are the exciting ruins and reconstructions in Sepphoris in Galilee, known in ancient times as “the jewel of all Galilee,” where Gabriel and Rebecca lived, and where Gabriel said farewell to his beloved daughter. 6. What is your favorite thing about Israel? 7. Do you have a favorite Israeli dish? Israeli cuisine is made up of the dishes of some 80 different countries from which Jews came in the first years after Israel was founded and since, as well as the Arab cuisine that has long been part of this land. What I like most about Israeli cuisine is how it relates to the Mediterranean diet that is considered so healthy. One of my favorite dishes is tahini, which is made of ground sesame seeds. There’s a tahini shop in the village of Abu Ghosh near where I live, and they have six different kinds, depending on how the seeds are ground and what variety they are. And they make it with honey in a form called halva, which is an amazing sweet snack or desert. Some restaurants here in Israel serve halva ice cream, which is really exotic. 8. What genre do you read when you want to escape or relax with a book? Any favorite authors? When I travel, in my down time I love to read a historical novel about where I am at that moment. In India, it was Beneath a Marble Sky by John Shors, In Cambodia it was the John Shors historical novel. Temple of a Thousand Faces, and in Taiwan, Green Island by Shawna Yang Ryan. I loved Ken Follett’s Pillars of the Earth, which led me to his trilogy. And my favorite airplane reading is...every book Jonathan Kellerman ever wrote, among the dozens, The Butcher’s Theater stands out, because it was set in...you guessed it...Jerusalem. 9. What is something interesting or quirky about you? Any particular interests? I’d have to say that’s would be a “who” not a “what:” The man I chose to share my life with 38 years ago this month. Arik is a wounded warrior from the Yom Kippur War in 1973. When I met him, he was already in a wheelchair and still is. Not only did our marriage lead to two daughters and five little grandchildren, but Arik’s love for travel, despite or because of his situation, has led to my own intense interest in travel for the disabled and in making heritage sites accessible for wheelchair users and others. Arik has traveled all over the world, first on his own or leading groups of wheelchair users, and in recent years, I’ve been able to accompany him. That’s how I got to India, Cambodia and Taiwan, among other places. We attend conferences about disabled transportation and the challenges of disabilities, and we hear so many amazing and inspiring stories about disabled people in far-off corners of the world who make the best of their situation, and a better world, for themselves as well as for others. I’ve just started working on my next historical novel, which is based on a Bible story about the family of King David, with relevance today, but with a surprise ending and closure that even the Bible never thought of! Enter via the Rafflecopter giveaway below. Giveaway will begin at midnight January 21, 2019 and last through 11:59 pm January 28, 2019. Open internationally except where prohibited by law. Winners will be notified within 2 weeks of close of the giveaway and given 48 hours to respond or a new winner will be chosen.